In the wake of the recent “Black Lives Matter” and “All Lives Matter” debate, it is time to discuss this very divisive issue. As have most African-American men, I have been directly affected by police brutality, or let’s just say bad policing. Racial profiling and police brutality go largely unchecked in urban, mostly minority dominated areas. It’s a reality of life that most people who don’t live in those areas don’t have to deal with. There is a big difference between the amount of white people dying by firearms versus the number of black people dying by firearms. The Henry Kaiser Family Foundation website states that only 7.9 whites die by firearm. For blacks the number is higher at 18.1 per 100,000. The CDC states that 49.9 percent of black Americans die by homicide between the ages of 20-24. According to The Prison Policy Initiative 2,207 blacks are incarcerated per 100,000 as compared to 380 whites and 966 Latinos, which is absolutely mind-blowing. 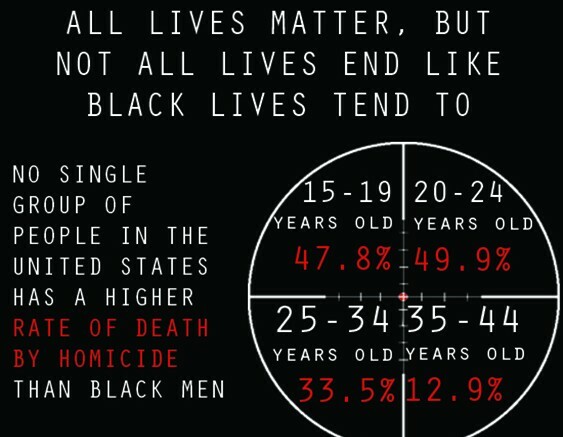 When you add up all of those statistics, I don’t think questioning whether or not black lives really matter in this country is an unreasonable assertion. That’s why it is very disrespectful when people who are not affected by this scourge try to minimize the impact that it has on its victims with campaigns such as All Lives Matter. The Black Lives Matter campaign is a direct response to police brutality and a plea to black youths to stop killing one another. It is an indictment of the police and black youth,not any other ethnic group. The police and black youths have one interesting thing in common, they both kill black people because they see no value in black lives. This is an issue that desperately needs to be addressed,not mocked. Police brutality has been an issue that the black community has been dealing with since there has been such a thing as a black community. Black on black violence is the offspring of the historical attempt by people not of color to demean and dehumanize black people. So now that concerned citizens are taking a stand, trying to bring light and provoke dialogue on such serious issues as police brutality and black on black crime, here come the nay sayers. The All Lives Matter campaign is nothing more than people thumbing their noses at the Black Lives Matter campaign. It serves no purpose other than to stir up controversy and to attempt to belittle those who support Black Lives Matter. If all lives matter then why do people get so offended when you make mention of the black ones? When people decide to wear pink in honor of breast cancer awareness, people who support other cancer awareness movements don’t picket and try to minimize breast cancers impact on the community. Save the white rhino supporters don’t try to throw a monkey wrench in the save the blue whales supporters campaign either. That would be a big negative. But it seems like whenever someone tries to do anything to support, uplift or empower African Americans, there’s always a group or movement somewhere that tries to bring fault to what is almost always a noble cause. It makes you wonder if it is just ignorance, or a much more deeply rooted issue. We all know that all lives matter, but whether or not all lives matter in this country is not the question. Your fellow Americans are being slaughtered at an alarming rate by the very people who are entrusted to protect them. It is absolutely un-American to ignore this fact, but to promote a campaign that minimizes this horrific reality takes it to another level of uncaring. Nothing positive comes from All Lives Matter. Be the first to comment on "Opinion: “Lives” Movement Paints a Different Picture"